Sharon Lee had always been passionate about being involved in charity and community programmes. It was nurtured in her from young as she was actively involved in the Leo Club during her schooling days back in the 80s. Subsequently, this passion of hers came in very useful when she was gifted with a special needs daughter. Sharon managed to get her daughter educated but soon realised that once the special needs courses were completed, there were hardly any avenues for these capable individuals to be included in the mainstream workforce. Inevitably this bleak future of not having any opportunity to use their skills after attending the courses made them feel left out and useless. This resulted in Sharon putting on her thinking cap to brainstorm ways to deal with this unfortunate reality; her goal was to create a platform providing employment opportunities to special needs individuals, especially those interested in the culinary arts. 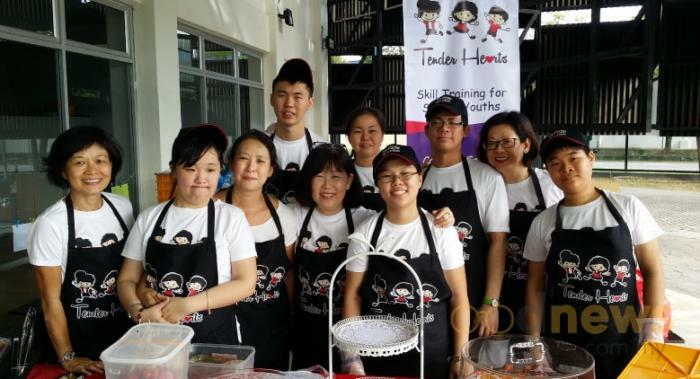 Back in mid-2016, the idea of Tender Hearts, a catering business run by special needs adults was created. It started informally and soon Sharon managed to get the social enterprise sorted and registered it in December 2016. Since then, Tender Hearts has grown from strength to strength and moved from just opening pop up stands and small catering jobs to making thousands of their signature chocolate chip cookies for large corporate bodies. Early this year, Sharon decided to take Tender Hearts to the next level and create a permanent venue for the team to ‘anchor’ and hire members of the special needs community on a regular basis. Thus was born the Tender Hearts café in April 2018. The cafe is run by Sharon, a group of parents of special needs children and special needs youth with autism and Down Syndrome. This not only provided some stability to the organisation but also continuous employment for the special needs adults. ‘The café acts as a training centre and future employment place for this pioneer group of special needs adults and will slowly bring in more special needs adults,’ elaborates Sharon. Sharon encourages everyone to be more inclusive towards the special needs community and more importantly to include them into the workforce as they too deserve equal rights and opportunities. She is also grateful to the backing of the Make It Right Movement powered by Brickfields Asia College, which has been very supportive towards helping with the opening of the café and in the design of the menu and brochure. Besides that, the Make It Right Movement has also been sourcing for catering gigs for the café to great success. Tender Hearts café is located at Lot 2.17, Level 2 of Summit USJ in Petaling Jaya. The café has a regular menu and a daily special menu. All the food has a home-cooked vibe with a simple but delicious range of dessert offerings too. Within three months of its opening, the café is breaking even, thanks to its catering gigs. It is hoped that with the support of the community, the catering and café can be two separate profitable entities. Feel free to contact them at tenderheartssent@gmail.com as they welcome any form of support towards inclusion, acceptance and equality for special needs.